This has been a busy week to say the least! Not only am I preparing to move schools, I have been at 3 CPD events in two days and the new primary curriculum has been released (almost). The 3 events were Computing at Schools (NTU Hub), TeachMeet Nottingham and The Festival of Innovation. At all 3 events I was involved in running workshops, but it was good to spend time listening to others and finding about about computing and programming. My good friend Peter Bevington (@PeteBevington) has great ideas for a new primary curriculum which he has already started embedding so do get in touch with him for your long term ICT plans! Meeting other teachers is also great and that’s how I pick up new ideas. 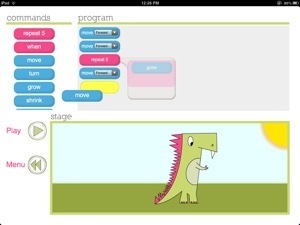 So here’s my favourite three Apps for programming on the iPad (the 4th being BeeBot which we all know and love). By the way, these are all FREE on AppStore! This handsome chap has so much swag. 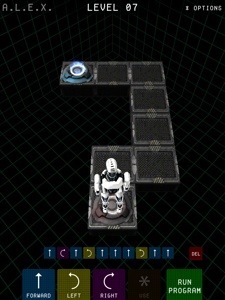 I also like how the app shows the commands you are programming- BeeBot doesn’t do this. She’s a lovely lass who operates somewhere between programs like scratch and flowol. Just drag and drop the simple commands in to the grey box and hit play. These critters are alien characters who have crash landed on another planet. 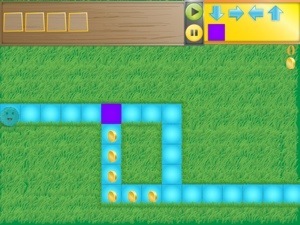 Program them to move in the same way ALEX and BeeBot work, but don’t forget to collect coins along the way! Check them out! They are free and very simple. Thanks to the folks who shared them with me this week. Read more about bringing the 2014 computing curriculum in to the foundation stage here and find out more about technology in the new Early Years Outcomes here. This book has been written for the Early Years practitioner or Computing Coordinator of a school looking to further embed the use of technology in their Foundation 1 and Foundation 2 settings. Marc Faulder, an Early Years teacher and Apple Distinguished Educator, provides a complete skills curriculum from 30 months to the Early Learning Goal in this book. Chapters introduce a skills curriculum, the assessment and progression of the skills and a thorough planning document to show how technology enhances learning in all Early Learning Goals.